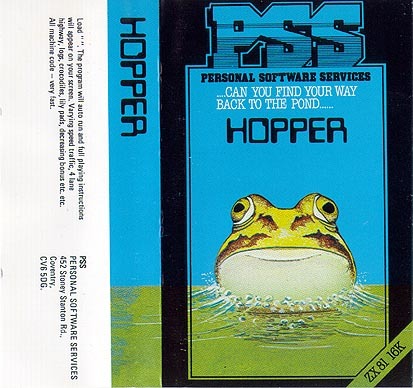 In the early 80s, when video games were just starting their migration from the arcades to the living room, it was common for games programmers to take their inspiration from the more popular arcade games, and so we ended up with a million and one variations on Pac-Man, Space Invaders, and Frogger - and landing fairly obviously in Frogger's pond is Hopper, released for the 16K ZX81 by Personal Software Services (PSS) in 1982. The publisher described it this way: 'Varying speed traffic, 4 lane highway, logs, crocodiles, lily pads, decreasing bonus, etc. etc. All machine code - very fast.' My 10 year old daughter, meanwhile, described it as 'like Crossy Road', before going on to ask whether the cover or the game had spelt lily pad correctly. Another thing that was part of the ZX81's charm was the creative use of its limited character set. To me, being one of the many whose first computer was a ZX81, the various half-smilies employed to differentiate some of the vehicles lend this game a sense of badly-drawn nostalgia which somehow manages to disguise the fact that you are trying to guide a succession of Ms across a busy highway and a croc-infested river to a row of Qs, all with absolutely no assistance from a 007. In fact I think he was probably driving one of the more sinister looking little black blobs. Cursor keys are a great idea in the right context, but that context is not one of guiding a small capital letter across a screen full of fast moving punctuation which will kill you if it passes next to you, never mind actually hitting you full in the froggy face. 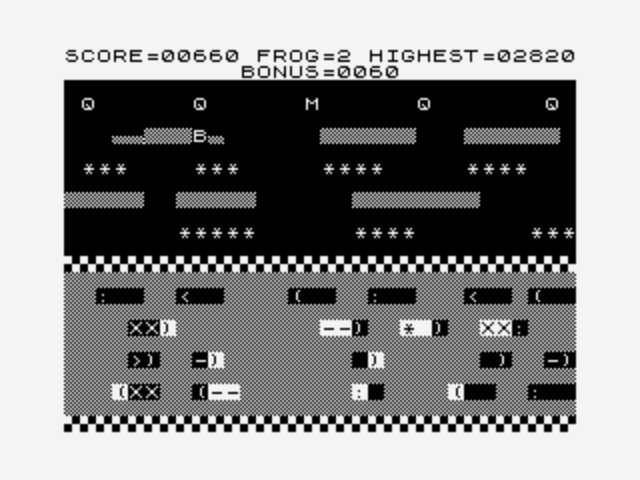 If you thought the ZX81's membrane keyboard was bad for typing in BASIC programs, that's nothing compared to using it to play a machine code game with the least intuitive control keys known to frog-kind. Having said that, beating the control system into submission is kind of addictive, and once you've trained your fingers and get that first pseudo-frog home the game suddenly feels playable; the challenge is on! The game might get harder after clearing the first screen, but while the screenshots are emulated, the review is authentic - loaded from tape onto my ZX81 for the most retro of retro experiences - so I had a RAM pack wobble before getting anywhere near finishing a screen. In summary then: there's no sound, the graphics are crude at best, and the control system is every carpal tunnel's worst nightmare. It's bloody fantastic!